General Description of Species, Subspecies, and Related Species: The white-tailed ptarmigan (WTP) is endemic to alpine regions of western North America. Its two closest relatives, the rock (L. muta) and willow (L. lagopus) ptarmigan, are more widely distributed (both are circumpolar in distribution in the northern hemisphere). Five subspecies of WTP have been identified. However, some grouse experts have questioned the validity of the subspecies designations because of the lack of comparative work throughout the species range. General Description and Species Variation: The WTP is the smallest grouse in North America with an average length of 30 to 34 cm. Body mass ranges from 345 to 410 g for males and 350 to 425 g for females depending on time of year and age class. White-tailed ptarmigan are in an almost continual state of molt from April to November. They are completely white during winter except for their black eyes, toenails, and beak. It is the only species of grouse with completely white tail feathers. During the breeding season, males have a conspicuous hood and necklace of coarsely-barred brown and black feathers. Females are mottled brown and black with yellow barring (absent in males) on their head, breast, flanks, back, and upper-tail coverts. Males retain pure white lower breast, abdomen, and under-tail coverts throughout the year. In comparison, females replace these feathers with more subdued yellowish-brown or buff-colored feathers with black barring. Both genders have eye combs, but the combs are more prominent and vividly red on males compared to females. Males and females in summer plumage appear gray to light gray-brown as the barred feathers, indicative of the breeding plumage, are replaced by finely-vermiculated, speckled-gray and reddish-brown colored feathers on the back and flanks. Females retain some of the black, brown, and yellow-barred feathers characteristic of their breeding plumage primarily on the nape, flanks, and inner wing. The undersides remain the same, white on males and yellow-brown to buff with barring on females. Diet: The diet of WTP is most restricted during winter and most diverse during summer. The buds, twigs, and catkins of birch, willow, and alder are the primary winter foods consumed by WTP. Willow is the most important winter food in the southern portion of the range. Alder and, to a lesser extent, birch are the most important winter foods further north where WTP occur together with rock and/or willow ptarmigan. Seeds, flower heads, and leaves of various forbs are consumed during summer and early fall. Insects, because of their high protein content, are critical foods for juveniles during the first 2-3 weeks of life but are minor items in the diet of adult birds. In some areas, willow remains a prominent component of the diet year-round. Berries may be consumed during the fall, particularly by birds in the more northern populations. Breeding Characteristics: White-tailed ptarmigan are monogamous and generally mate for life. The pair bond lasts about 2.5 to 3 months after which time they go their separate ways until the next breeding season. Males vigorously defend their territories against neighboring males and intruding non-territorial males. They return to the same territory year after year. However, if the male is killed, the female may move to a different territory or pair with the new male that takes over the territory of her former mate. An adult male that is established on a territory seldom moves to another territory. Yearling males frequently occupy marginal territories or spend their first breeding season as non-territorial males. Yearling males on marginal territories rarely attract females. For this reason, they may move to a higher quality territory their second year. Nesting Characteristics: Female ptarmigan nest on the ground within the boundaries of their territory. Construction of the nest, incubation of the eggs, and rearing of the young are activities performed exclusively by the female. The nest is a shallow depression on the ground lined with dried vegetation and soft body feathers. All females attempt to initiate at least one clutch. The average clutch size for the first nest attempt is about 6 eggs. The incubation period lasts 24 to 26 days. The eggs are oval in shape and contain moderate to heavy reddish-brown or chestnut-colored blotches or speckles on a creamy brown to light cinnamon background. Older females tend to initiate nesting earlier, lay larger clutches, and renest at higher rates than younger females. Birds such as WTP that breed at high elevations are at a disadvantage because the breeding/nesting window is short. As a result, nesting success is highly variable. In some years, when the snow-melt is delayed or inclement weather persists throughout the nesting season, nesting success can be low (< 20%) with little or no opportunity for renesting. Conversely, during normal or mild springs, nesting success can exceed 60%. Brood-Rearing Characteristics: Females and their young abandon the nest site soon after the last egg hatches. The chicks are precocial at hatching, which means they are fully feathered and capable of foraging on their own. They require brooding during the first couple weeks of life until they can regulate their own body temperature. They are capable of sustaining short flights at about 10 days of age. Some hens raise their broods on or near their breeding territories, while others gradually move upslope to areas more suitable for brood-rearing. These movements can be in excess of 3 km but usually average less than 1 km. Brood ranges, like territories, are used consistently from year to year. The brood may range over an area of 3 to 30 ha depending on the quality of the habitat. By late summer, most successful hens and their broods will have moved uphill and can be found using the same areas as males and females without broods. Brood mixing or shuffling often occurs at this time with 2 or 3 individual broods joining together into a single flock known as a gang brood. 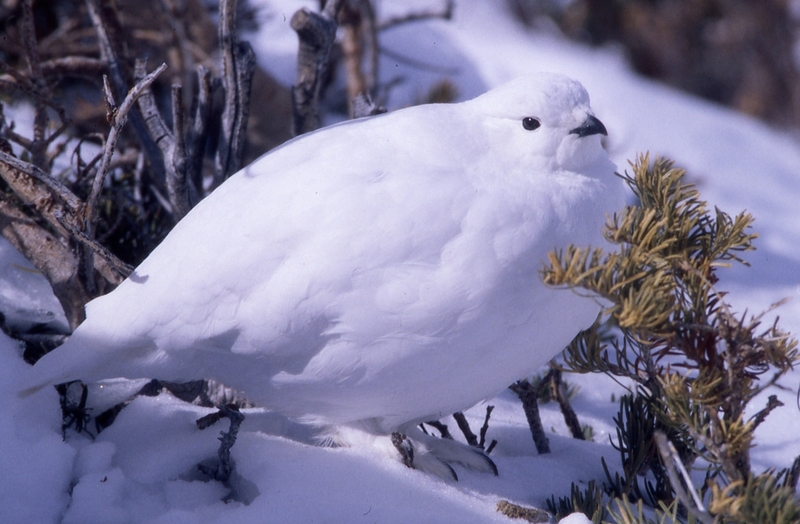 Habitats: White-tailed ptarmigan inhabit alpine ecosystems at or above treeline. Alpine refers to landscapes that occur at high elevations where trees are extremely dwarfed or can no longer grow. The term “tundra” is sometimes used interchangeably with alpine, but tundra more correctly refers to landscapes that occur at latitudes beyond the limits where trees can grow. The presence of willow, birch, or alder and the availability of snow-free areas are the two most important factors determining where WTP breed. Early in the breeding season, most territories are situated near treeline and centered around shrub stands that protrude above the snow. As the snow melts, the territories elongate uphill to include areas with more rocks, herbaceous vegetation, and less shrubs. The elevation range of breeding areas varies depending on latitude, slope, and aspect. For instance, in Alaska, at the northern extreme of the range, WTP breed at elevations from 1,200 to 1,600 m. In the southern portion of the range, breeding areas occur at 3,300 to 4,200 m elevation. Most nests have some type of cover immediately adjacent to the nest. This cover is used primarily as protection against inclement weather and less for concealment. Rocks are the preferred cover because they offer greater protection from wind and snow than vegetative cover. For concealment, hens rely mainly on their cryptic coloration when sitting on the nest. Although WTP will nest in dense cover, they prefer more open sites that offer multiple, unhindered escape routes off the nest. Brood-rearing areas generally occur above the elevation of breeding territories. These areas usually center on late-lying snow fields or other moist sites and are best characterized as a mosaic of rocks and low-growing vegetation. Males, females without young, and females with broods will continue to use these areas into early fall as long as snow conditions permit. With the first major snowstorm, they move downhill to the upper edges of shrub communities within the zone of breeding habitat. Rocks are still a prominent feature of fall use-areas. Since ptarmigan are molting into their winter white plumage at this time, they prefer areas with a patchwork of snow cover, rocks, and open ground. Areas used in winter typically occur at treeline or slightly below treeline in drainages or basins where food (willow, birch, and alder) and roosting sites (soft snow) are readily available. Males and females tend to segregate in winter with males wintering at slightly higher elevations and in smaller flocks than females. Range: White-tailed ptarmigan range as far north as south-central Alaska, north-central Yukon Territory, and extreme western portions of the Northwest Territories. From here the distribution extends southward along the Coast Mountains of British Columbia into the Cascade Mountains of Washington to Mount Rainer, and south along the Rocky Mountains through southwestern Alberta to northern New Mexico. Populations also occur on Vancouver Island, British Columbia. In addition, WTP have been successfully introduced into the Uinta Mountains in Utah and Sierra Nevada Mountains in California, and on Pikes Peak in Colorado. Efforts to introduce WTP into the Wallowa Mountains in northeastern Oregon were unsuccessful. There are no valid records of WTP occurring in Idaho or the Olympic Mountains in Washington. The only know occupied areas in Wyoming are in the Snowy Range in the southeastern portion of the state. However, it is possible WTP have been extirpated from this area due to excessive grazing and high recreational use of alpine areas. White-tailed ptarmigan also have been extirpated from portions of northern New Mexico, but birds have been reintroduced into some areas. North of central British Columbia, the WTP can be found in the same general areas as willow and/or rock ptarmigan. South of central British Columbia, the WTP is the only species of ptarmigan present. Approximate distribution of white-tailed ptarmigan in western North America. Stars show locations where white-tailed ptarmigan have been introduced into previously-unoccupied habitats (Sierra Nevada Mountains, CA; Wallowa Mountains, OR; Uinta Mountains, UT; and Pikes Peak, CO) or reintroduced into formerly occupied habitats (northern New Mexico). Predation: Overall predation rates on WTP are low compared to other grouse species. This is the result of several factors. First and foremost, the suite of predators that hunt above treeline and their abundance are significantly less than in other landscapes because of the harsh conditions that exist in the alpine. Second, during winter, when ptarmigan are concentrated on small areas and potentially most vulnerable to predation, predators are least abundant. This particularly applies to avian predators, which are the primary predators of WTP at other times of the year. Third, WTP occur at low densities in scattered patches of suitable habitat; thus, no predator can afford to specialize on WTP. Finally, WTP are inconspicuous, seldom fly unless approached within a few meters, and only move when feeding, making them exceptionally difficult to detect by predators that rely on vision to locate prey. Despite their reluctance to fly, WTP are strong fliers and can usually out-fly most avian predators. Survival: For non-hunted or lightly-hunted populations, survival rates consistently exceed 50% (range = 56-76%). Survival rates are much lower (30-40%) in heavily-hunted populations. The average life span is 3 years, but banding studies have revealed some birds living over 10 years. Males generally survive at a higher rate than females. Population Status: Population sizes and trends are mostly unknown except in localized areas. Studies indicate breeding densities range from 2 to 14 birds per km2 and fluctuate widely between years and locations. The present distribution of WTP has remained relatively unchanged compared to the historic distribution. Current Problems and Threats: One of the greatest threats to WTP and the alpine ecosystems upon which they rely is global climate change. The potential consequences of climate change to ptarmigan are loss and fragmentation of habitat through changes in the quantity and quality of snow cover, changes in the distribution and composition of plant communities, and upward movement of treeline. More-immediate threats include mining, grazing, and water developments. The WTP is one of the grouse species least tolerant to habitat disturbances because it occupies a very stable and extremely fragile environment that can take decades, if not centuries, to recover. Alpine ecosystems are among the most difficult to restore following disturbance. Although substantial progress has been made in developing techniques to restore damaged alpine landscapes, this technology still has limited success and is not capable yet of restoring alpine plant communities to their pre-disturbance condition. The same is true in terms of trying to enhance alpine habitats. The best management practice for alpine systems is to leave them alone. Currently, the WTP is not federally threatened or endangered in any portion of its range. However, in 2010, the Center for Biological Diversity filed a petition to list the southern and Mount Rainer subspecies of WTP as threatened pursuant to Section 4 (b) of the Endangered Species Act. The U. S. Fish and Wildlife Service issued a finding in 2012 that the petition contained sufficient biological information to warrant a status review. This review is in progress but with no schedule as to when it will be completed. A major argument in this petition for listing the WTP is the threat that global climate change poses for the species. Winter White-tailed Ptarmigan; by Richard Wilberforce.